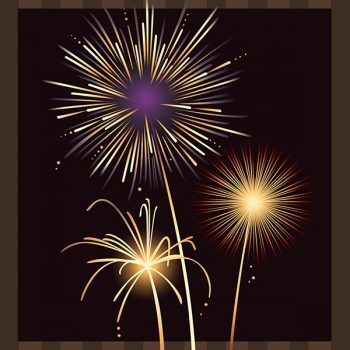 Fireworks are the essence of July Fourth, a celebration of joy and pride on public display. But with fireworks comes risk – especially to children. And the careless. And the inebriated. Four states even allow 12-year-old to purchase fireworks. Seriously. To make its point about the wisdom, or lack thereof, of playing with fireworks, STAT offers up a graphic featuring an array of emergency room reports. The notes describe a 2-year-old’s burns to the abdomen from a sparkler, an 8-month-old’s ingestion of fireworks left lying on a table, a 19-year-old’s eye injuries from a bottle rocket, and a 13-year-old's burns to both hands after lighting an entire box of sparklers. You’d think that anyone who’s ever been, or known, a 13-year-old could have seen that coming. And yet, year after year, those ER visits prove otherwise. And my favorite: Never carry fireworks in your pocket. Also, for those who ignore the above, the guidelines specify what to do in case of eye injury. • Don't delay medical attention, even if the injury seems minor. • Don't attempt to rinse out the eye. This can be very damaging. • Avoid putting pressure on the eye. Avoid touching the injury. • Don't give the victim aspirin or ibuprofen to try reducing the pain. These thin the blood and might increase bleeding. • Don't apply ointment or any medication. It's probably not sterile. So, have a safe and happy Fourth of July. Injuries are a poor way to celebrate independence. By the way, the STAT graphics also break down injuries by age and gender. Super cool.